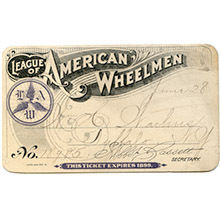 The League was founded as the League of American Wheelmen in 1880. 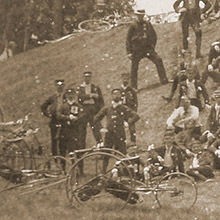 Bicyclists, known then as “wheelmen,” were challenged by rutted roads of gravel and dirt and faced antagonism from horsemen, wagon drivers, and pedestrians. Read more about our detailed history below. Our vision is a nation where everyone recognizes and enjoys the many benefits and opportunities of bicycling. If you care about bicycling, become a League member today. 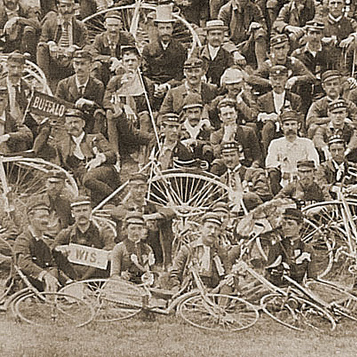 The League began as the League of American Wheelmen (LAW) in 1880 -- Newport, R.I. was the location of our founding meeting -- and was responsible for defending the rights of cyclists from its start. 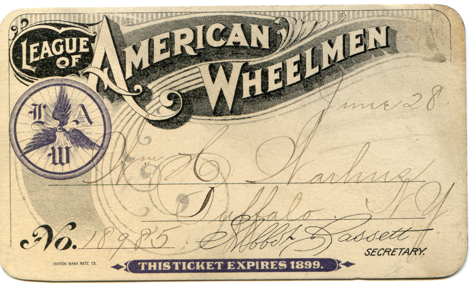 The League of American Wheelmen is credited with getting paved roads in this country before the reign of the automobile. By 1898, the League of American Wheelmen had more than 102,000 members including the Wright Brothers, Diamond Jim Brady, and John D Rockefeller! The League has had its ups and downs --- it actually ceased to exist on two occasions, but was resurrected each time. Since its most recent revival in 1965, the League (renamed the League of American Bicyclists in 1994) has focused its programs on education in addition to advocacy. The League's Bicycle Friendly Community℠ program recognizes communities nationwide that support the five E's of bicycling -- education, enforcement, engineering, evaluation and encouragement. The League's BikeEd program offers the only nationwide instructor certification program. More than 200 new League Cycling Instructors (LCI) were certified in 2005. The League's BikeEd program teaches riders to feel comfortable riding on the road, in addition to bike fit and maintenance. The League proclaims National Bike Month℠ each May and offers information and "how to" kits on planning events for Bike to Work week and/or day. The League's magazine, American Bicyclist, and website offer information on clubs, rides, classes, as well as fact sheets on topics like group riding, why to ride on the right, how drivers should share the road with bicycles, and many other timely subjects. The League's 1997 move to Washington, D.C., facilitated working with the government, and the Senate's Bike Caucus. Each year the League hosts the National Bike Summit, where advocates and elected officials of all types gather to share best practices, hear from engaging speakers, and meet their counterparts from across the country. On the final day of the National Bike Summit, attendees engage their Senators and Representatives in our famed 'Lobby Day' with concrete, actionable asks to help make their communities better for bicycling. Other legislation on which the League has worked recently include the Bike Commuter Act that would extend the transportation fringe benefit in the tax code to bicycle commuters, as well as our ongoing work advocating for common-sense safety protocols for Autonomous Vehicles.